lower center on parapet: .Joannes.bellinus. Probably purchased 1816/1823 in Italy by Barthold Georg Niebuhr [1776-1831], Bonn; by inheritance to Marcus Niebuhr, London; probably by inheritance to Mrs. J.M. Tod, London; sold 17 February 1931 to (J. Leger and Son, London). Frank Oldham, London; (his sale, Sotheby's, London, 21 May 1935, no. 103); C. Huggins. (Count Alessandro Contini-Bonacossi, Florence); sold July 1935 to the Samuel H. Kress Foundation, New York; gift 1939 to NGA. According to the catalogue of the May 1931 exhibition at Leger & Sons, London, in which the painting first appeared. Niebuhr, a historian, was the Prussian Ambassador to the Papal Court in Rome from 1816 to 1823. According to a letter of 13 April 1932 from H.L. Leger to Bernard Berenson (Villa I Tatti, Florence; copy in NGA curatorial files), Niebuhr specifically mentions the painting in one of his letters. The first published discussion of the painting (Detlev, Baron von Hadeln, An Unknown Portrait by Giovanni Bellini, The Burlington Magazine 58I [May 1931]: 219) indicates the painting came from the collection of an English family, who acquired it by inheritance from Niebuhr's estate. Fern Rusk Shapley names Marcus Niebuhr and Mrs. Tod, and gives the 1931 sale date (Paintings from the Samuel H. Kress Collection: Italian Schools, XV-XVI Century, London, 1968: 41-42). According to an annotated copy of the sale catalogue in the NGA Library. The bill of sale to the Kress Foundation for more than twenty paintings, including the Bellini, is dated 10 July 1935 (copy in NGA curatorial files). Exhibition of Old Masters in Aid of the National Collections Fund, J. Leger and Son, London, 1931, no. 11, as Portrait of a Young Man in a black coat. Seven Centuries of Painting, California Palace of the Legion of Honor and M.H. de Young Memorial Museum, San Francisco, 1939-1940, no. L-2, repro. Il Rinascimento a Venezia e la pittura del Nord ai tempi di Bellini Bürer Tiziano [Renaissance Venice and the North: Crosscurrents in the Time of Bellini, Dürer, and Titian], Palazzo Grassi, Venice, 1999-2000, no. 8, repro. 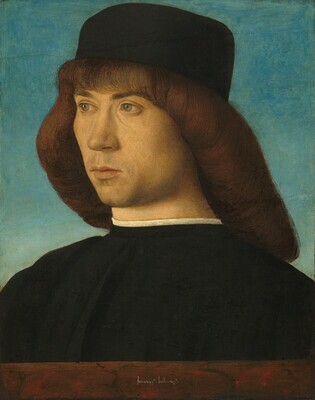 Giovanni Bellini, Scuderie del Quirinale, Rome, 2008-2009, no. 35, repro. Preliminary Catalogue of Paintings and Sculpture. National Gallery of Art, Washington, 1941: 19, no. 293. Book of Illustrations. National Gallery of Art, Washington, 1942: 245, repro. 67. Paintings and Sculpture from the Samuel H. Kress Collection. National Gallery of Art, Washington, 1959: 139, repro. Summary Catalogue of European Paintings and Sculpture. National Gallery of Art, Washington, 1965: 11. European Paintings and Sculpture, Illustrations. National Gallery of Art, Washington, 1968: 4, repro. Shapley, Fern Rusk. Paintings from the Samuel H. Kress Collection: Italian Schools, XV-XVI Century. London, 1968: 41-42, fig. 98. European Paintings: An Illustrated Summary Catalogue. National Gallery of Art, Washington, 1975: 20, repro. Shapley, Fern Rusk. Catalogue of the Italian Paintings. 2 vols. National Gallery of Art, Washington, 1979: I:34, II:pl. 22. European Paintings: An Illustrated Catalogue. National Gallery of Art, Washington, 1985: 39, repro. Tempestini, Anchise. Giovanni Bellini: catalogo complete dei dipinti. Florence, 1992: 160-161, no. 55, color repro. Humphrey, Peter. Painting in Venice. New Haven, 1995: 106-107, fig. 80. Boskovits, Miklós, and David Alan Brown, et al. Italian Paintings of the Fifteenth Century. The Systematic Catalogue of the National Gallery of Art. Washington, D.C., 2003: 64-66, color repro.